The Fianna Fáil leader told TheJournal.ie that Ireland will have less influence under the new agreement. 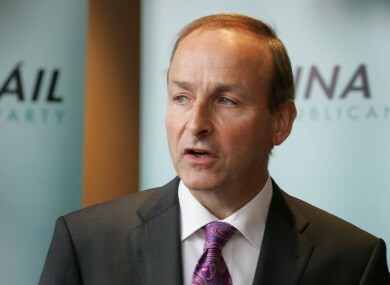 MICHEÁL MARTIN HAS warned that last week’s EU deal to strengthen fiscal cooperation leaves Ireland vulnerable to attack on our corporation tax rate. The Fianna Fáil leader also said he believes the agreement, which looks set to be joined by all the EU countries except Britain, will not be adequate to tackle the debt crisis. Speaking to TheJournal.ie after he was briefed on the content of the deal by Taoiseach Enda Kenny earlier today, Martin said it was “unclear how our corporate tax rate is protected” under the fiscal compact. He said that Ireland’s influence would be reduced in the new agreement, which strengthens the importance of direct relations between governments rather than EU institutions and excludes our traditional ally the UK. He added that the official EU communiqué had been “silent” on the issue of corporate tax. Martin, who met with Enda Kenny this morning along with Sinn Féin leader Gerry Adams, and Dáil technical group representative Catherine Murphy, also called for the Government to hold a referendum on the new EU measures – even if they did not involve constitutional changes. The Fianna Fáil leader rejected suggestions that a No vote would risk leaving Ireland out in the cold. “The Irish people would be saying they didn’t want to be a part of the intergovernmental union, but we would still be a part of the EU and the euro,” he said. The Government has suggested that a referendum may not be necessary. He also warned that the new deal would not provide the tools to tackle a eurozone debt crisis which has dragged on for months. He said the deal was focused on fiscal constraints, rather than providing more support to troubled economies. Email “Martin: EU deal leaves Ireland vulnerable on corporation tax”. Feedback on “Martin: EU deal leaves Ireland vulnerable on corporation tax”.